Mountain Mods Transparency is a clear choice for your Home Theater PC. The Mountain Mods Transparency is a unique case that will SPICE up any home theater system. It is laser cut from high quality 1/4 inch thick cast acrylic. 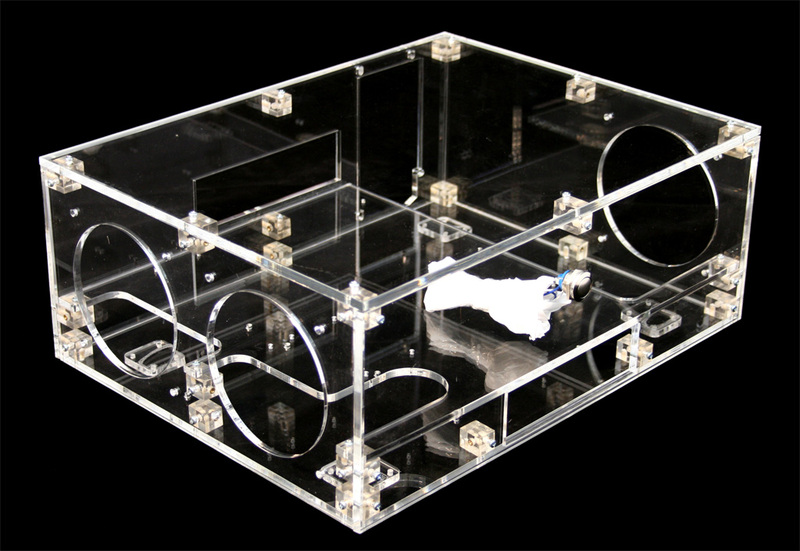 The result is a visually stunning enclosure with smooth polished edges. The Transparency comes cut in a split chamber format. At the floor level are mounting holes for a single Hard Drive and 5.25 Optical device. The Power supply also sits at floor level but extends into the upper level where your mATX motherboard sits in full glory. The Transparency comes with 2 x 120mm fan mounts laser cut on the left panel for air intake. The 120mm fans are cut to pass air directly over both the lower and upper chambers resulting in an efficiently cooled Hard Drive and Motherboard. On the right side the PSU exhaust fan as well as another 120mm mount on the case wall will exhaust the air out of the case. A single high quality nickel plated anti-vandal switch is centered into the front panel (for those wanting an illuminated switch - it can easily be replaced with an illuminated bulgin switch). The Transparency was designed to match the standard width of most Home Theater appliances for a more uniform look in the living room. In order to keep to the design no PCI cutouts are implemented into the standard design. This means you will need a mATX motherboard with onboard video, which should not be a problem as onboard video on mATX has become the norm. Empty Case Weight: 8 lbs. The Transparency comes unassembled - assembly is an option.